Catania Lucrezia Loft is located in San Gregorio di Catania, this detached holiday home features a terrace and a garden. The property is 3 km from Catania and boasts an amazing view over the sea. Free WiFi is provided throughout the property and free private parking is available on site. There is a dining area and a kitchen complete with an oven and a fridge. A flat-screen TV are available. Lucrezia Loft Garden Catania includes also a terrace which offer a nice view. Catania Lucrezia Loft is just 3 km away from Catania. Taormina is 37 km from us, while Giardini Naxos is 34 km far from our property. The nearest airport is Catania Fontanarossa Airport, 9 km from Catania Lucrezia Loft. We are at 5 km from Piazza Duomo, while Giardini Naxos is 34 km away. Our accommodation at 20 km from Rifugio Sapienza, the closest point to the Etna. Lucrezia Loft Garden is an independent apartment consisting of 2 double bedrooms, a spacious living room, kitchen, bathroom and laundry, balcony with beautiful views, garden and private parking. It is a 4 people apartment, with possibility to add 4 extra beds upon request for extra money. 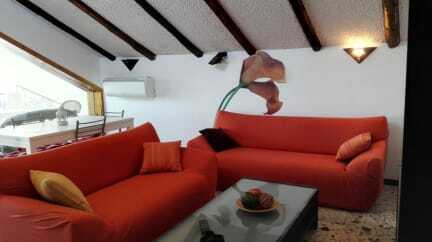 The apartment is composed of: 2 bedrooms with a double bed in each, and a living room with 2 sofa beds and a single bed. Cancellation policy: 72h before arrival. Payment upon arrival by cash. This property might pre-authorize your credit card. Reception: open from 2pm to 10pm.